CTA's - What is going on with size? CTA Intelligence reported the top 50 CTA's as of September 2016 and provided some good graphics on the names and the changes over the last year. 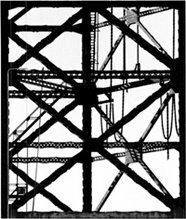 Taking a closer look at the data from the perspective of market structure and industrial organization provides some additional insights on the managed futures industry. We will focus the discussion on the top 50 managers because these are the ones that will receive the most interest from institutional investors. We can call this the relevant market. 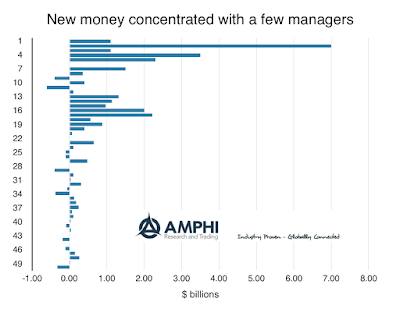 The market share of the top 5 managers is highly concentrated with those managers having just under 55% of all the $188.7 billion held by the top 50. This percentage has not changed in the last year even though $27 billion moved into this space in the last year. 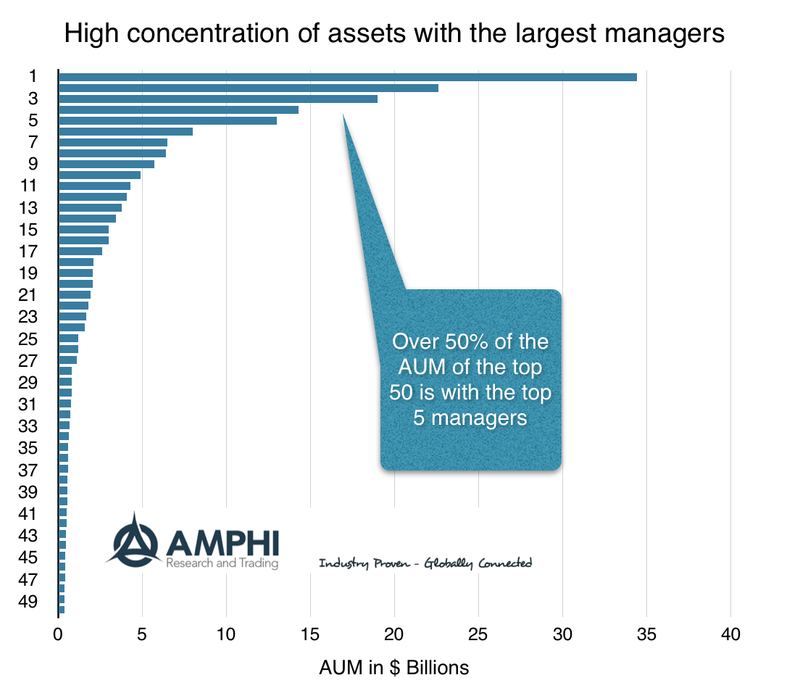 The bottom five managers represent less than 2% of the total with the median manager having $1.2 billion in AUM. There was only one switch in the managers in the top ten. Our graphs list numerically the top 50 without names to focus on the structural dynamics. All the graphs are sorted largest to smallest. 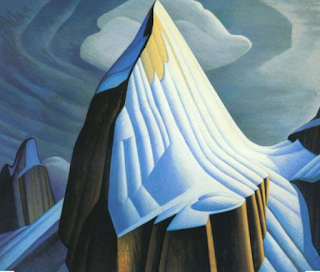 The flow of new money into managed futures was mixed but still highly concentrated. Five managers received more than their fair share, with 62% of all the new money raised, but only 2 of those managers were in the top five. 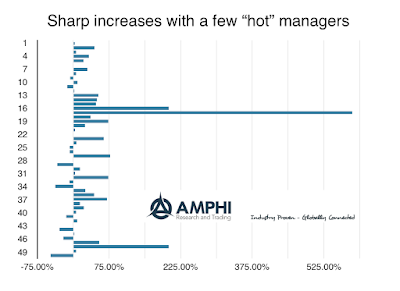 "Hot" managers will get a great share of the money raised; however, a close look will not see those managers as the most recent top performers. Nevertheless, strong rolling relative performance is associated with new money flows. 11 firms lost assets over the last year. Some firms saw explosive growth in assets under management, but they were not in the top 5 or ten. The big growth was in the second quartile managers by size. 10 firms grew by more than 50% in the last year and three saw increases of more that 100%. One firm grew by more than 500%. No firm in the top 50 lost more than 50% of their assets. Investors seem willing to stay with managers and slowly leave over time while those that are perceived as winners will see money fly in. 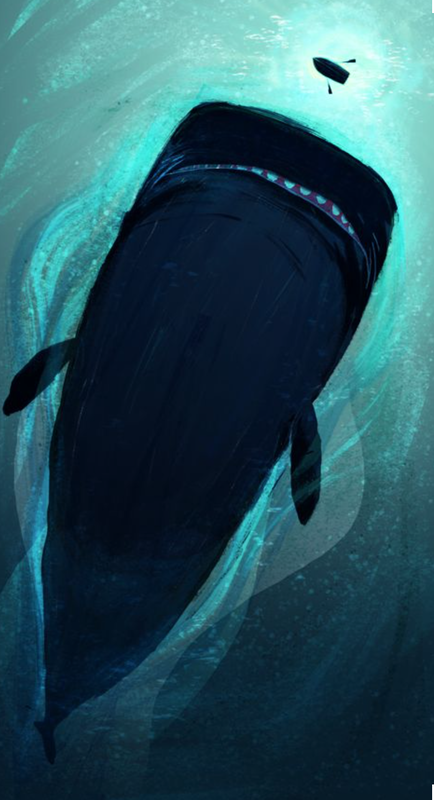 Should we expect the numbers we see? Yes, most industries follow a power law with relatively high concentration. Given the ease of moving money and the readily available information on managers, I am a little surprised at the high concentration, but it is not unusual even in asset management. 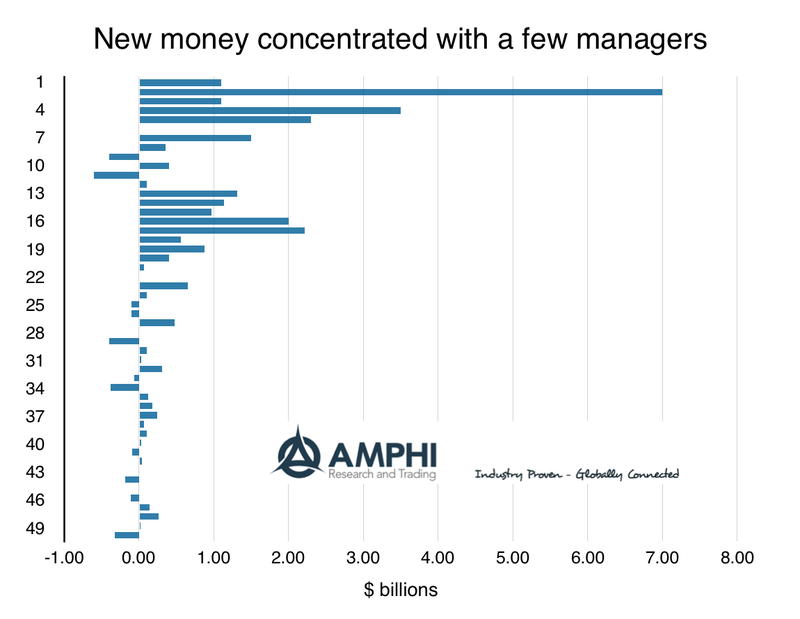 I am surprised at the high concentration of money flows to a few managers. There should be expected more flows into winners and out of underperforming managers, but these flows should be a little more disperse given volatility and market uncertainty. Given many investors will hold through a 3-year cycle, it should not be surprising that outflows are less concentrated. It is also surprising that the median in the top 50 is only $1.2 billion. We have seen pension emerging manager programs set the criteria that managers have to be below $2 billion. By that standard only the top 20 managed futures managers would be considered beyond the emerging threshold. The standards for what is a large manager in managed futures are just not that large. Investors have to rethink what it means to be a large manager in this hedge fund space. 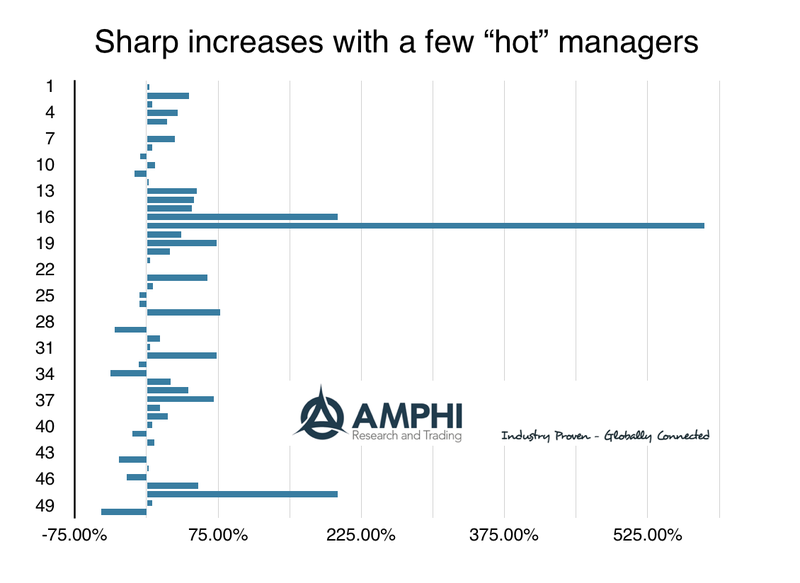 This list certainly gives some perspective on what it means to be a big managed futures manager and how fortunes can change if you are viewed as a "hot" manager. "I made my fortune by selling too early", a quote from Baron Rothschild used for an investment game by John Hussman. John Hussman has invented a game called "Baron Rothschild" as a teaching tool which is based on a simple process of drawing returns from a set of cards The sequence of cards can generate a performance record. Think of this as a form of Monet Carlo simulation from a return distribution. The player can call stop after any number of picks or he can continue to pull return cards to compound his performance. Hussman finds that a limited number of picks will do better than drawing more cards in order to run up the returns. There is some interesting math here on optimal stopping times and whether all or a portion of money is invested, but we will leave that for another discussion. See Spencer Jakab's Heads I Win, Tails I Win for the reference and further description of the game. This game and the Hussman conclusion lead to one of the age old issues with trend-following and investing in general. 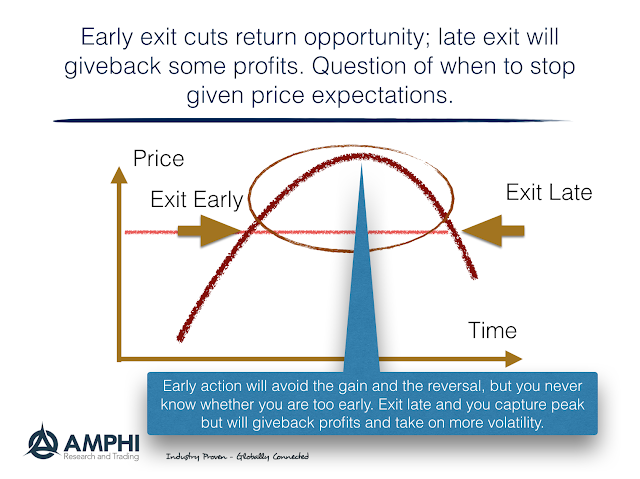 Should you get out early from winning trades? In trend-following, the idea is that you hold your long positions in any trend as long as the market is going up. You may have a trailing stop, but you should be willing to give up returns on a short-term reversal in order to stay in a position. Because you don't know when the top or the bottom of the market will occur, just hold onto positions even if it means giving back some profits. The more general investment advice is simple, hang onto your winners and sell your losers. Hussman is willing to say that walking away early before tops or bottoms is always better that waiting for the peak or trough and then giving back some profits. This question is fundamental to all investment strategies, yet there has been limited work and providing a clear answer. Clearly, the momentum risk premium factor research suggests that following past behavior with holding positions until momentum reverses has been a successful strategy. Nevertheless, there is also work that shows that momentum strategy are subject to crash risk or a large reversal. Some have argued that the risk premium is received because there is crash risk with momentum strategies. Higher returns come with higher risk. Our simple graph tries to address the key problem. Should you continue to play the game and hold a position when you don't know when there will be a reversal? I can argue that this issue of profit-taking or exit management and risk management is more critical than the question of how do you identify a trend. What are the best investment warnings? Commodities - Is this the time to allocate?